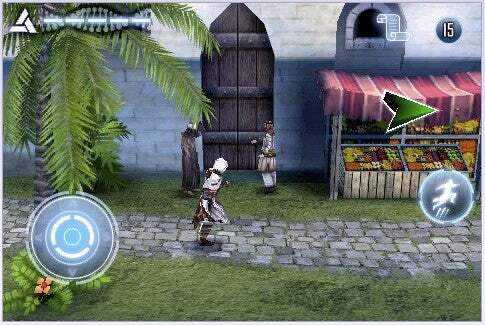 Gameloft has announced the release of Assassin’s Creed: Altair’s Chronicles, a new stealth action game for the iPhone and iPod touch. It costs $10. The prequel to the hit console game Assassin’s Creed, Altair’s Chronicles puts you back in the role of Altair, a 12th-century Master Assassin sent by the Order of Assassins to steal “The Chalice” from the Templars. Your goal is to bring an end to the Crusades and restore peace and order to the Holy Lands. Just like its console counterpart, Altair’s Chronicles emphasizes stealth and strategy — Altair can use acrobatic moves and combo attacks, mixing swordplay and kicks to overcome his enemies. You can either engage in close combat or in long range attacks, and skill-based mini games test your patience and dexterity. The game features 3D cinematic cutscenes and voice acting. Because of the violent content, Apple has rated it 12+. System requirements call for iPhone 2.2.1 software and an iPhone or iPod touch.